Mixed over a three week period, hope you enjoy my new mash. It mixes Depeche Mode – Enjoy The Silence (Ewan Pearson Extended Instrumental) and Empire Of The Sun – Walking On A Dream (Acapella). I think they’re a very good match – Empires vocals have the same dark feel as Depeche Mode’s Dave Gahan, and I like the way the Depeche mental adds a different fresh vibe to the already cool Walking On A Dream single. Had to clean up the Depeche mental as the mp3 I had sounded like it’d been ripped from vinyl – lots of crackles and scratches. Once cleaned, I laid the Empire vocals over the top and cut them around to match the chorus and verse of Depeche. Added some reverb and echo here and there, then mastered before releasing. Hope you enjoy the results – comments and feedback welcome. EDIT : Reached No. 5 in the Mashstix.com weekly mashup chart – September 2009. DJ Flashard – Depeche Mode vs Empire Of The Sun – Walk In Silence (Enjoy The Dream). Mixed using Depeche Mode – Enjoy The Silence (Ewan Pearson Extended Instrumental) and Empire Of The Sun – Walking On A Dream (Acapella). Been away for a few days, but had the idea of this mash from the Metro Station / Marvin Gaye mash I did a last month. Marvin’s vocals seem to fit so naturally over Metro Station that I couldn’t resist giving them another go. I got the mental several months ago, so just had to decide which Gaye track matched it best and Lets Get It On was perfect. Having decided where the chorus and vocals fit best over the mental, the only real job was to make sure Marvin is on tempo and in key (hopefully I’ve achieved this!). Having mastered the final track, I’m happy with the results. Hope you like too. EDIT : Reached No. 7 in the Mashstix.com weekly mashup chart – September 2009. DJ Flashard – Metro Station vs. Marvin Gaye – Lets Get Seventeen Forever. 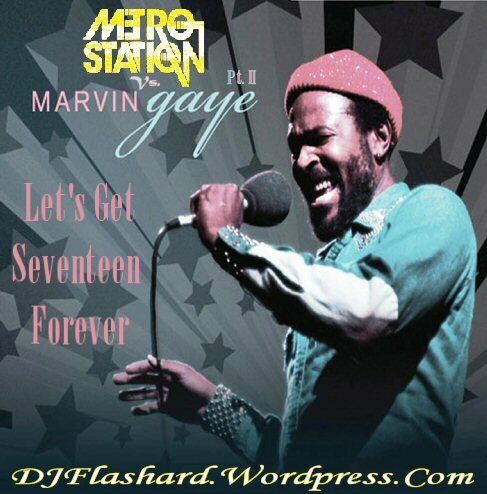 Mixed using Metro Station – Seventeen Forever (instrumental) and Marvin Gaye – Lets Get It On (Acapella).